The Place Perhaps one of the most awarded and luxurious resorts in Southeast Asia, InterContinental Danang Sun Peninsula Resort has been a destination by itself. It is therefore not surprising to us that the hotel clinched the coveted World Travel Awards’ World’s Leading Luxury Resort in 2016 and was also named by CNN as of the Top 21 of the World’s Most Beautiful Beach-front Hotels in the same year as well. The drive from Danang city itself will take you 30 minutes by taxi through the Son Tra Peninsula Nature Reserve, east of the city. And the first steps into the resort, you will have no doubt that it is not going to disappoint. A small lobby caters sufficiently for the 200 luxury rooms here in the resort, with a mix of classic rooms, terrace suites, penthouses, and villas. To get around the resort, you can choose to go by foot, by a buggy or the cable car built in the centre of the resort – which brings you through the 4 levels of the resort, cleverly named Heaven, Sky, Earth and Sea. Heaven is where the lobby, concierge, Citron (the resort’s main restaurant) and the club lounge are located, with the renowned Michelin-starred chef Pierre Gagnaire’s La Maison 1888 located at Earth, and of course, the swimming pool, beach and 2 other restaurants, Barefoot and Long Bar located at the Sea level. The Room We checked in to the King Terrace Suite Ocean View room, which comes in 3 tier, Resort Classic, Son Tra and Club. Son Tra rooms are located at the highest level of the resort, with the Club room offering the guest the 24 hour service at the club lounge. At 80sqm, this is a spacious room, of which you get a rather private balcony with full view of the resort’s private bay at the Son Tra Peninsula. The King-sized bed sits in the middle of the room, overlooking the bay, with a very generous space allocated to the entrance of the room, complete with traditional Vietnamese wooden furniture. One of the highlights of our spacious room is definitely the showers – you get a double vanity unit, complete with a bath tub with ocean views and one of the best rain showers we have personally stood in – and if you prefer, feel free to open the windows for a full glorious view of the bay while showering. Upon stepping out of the room, we were overwhelmed by the sheer size of the large balcony space, with a marble top dining table where you can enjoy your in-room breakfast should you be feeling lazy or all-too-comfy to step out of you comfort zone. We all have our dreamy moments. The Facilities From a beachfront rooftop swimming pool, to the well-equipped gym and tennis court, the resort has all the basic facilities and more. At InterContinental Danang Sun Peninsula Resort, you can do way more than in any other resort, and we found ourselves with no excuse to step out of the resort at all. From movie screening at the Summit Auditorium, to singing Karaoke at M Rouge, organised tours by the resort to trek the nature reserve, or if you are simply looking to chill, you can simply spend time at the private beach. One of the highlights during our stay, and probably a spot which we spent a great deal of our time, was the gorgeous swimming pool. From here, you get a full view of the resort with the hillside backdrop, and get to soak in the waters with sounds of the waves hitting the shores. The service at the resort during our visit was top-notch, as the attentive service staff would prepare a bottle of cold mineral water and lay the towels for your chosen deskchairs for us during each of our visit to the pool or beach. And yes, travelling between the facilities and within the resort is well-facilitated by the 24 hours service cable car, or if you fancy, a ride on the buggy upon your request. And of course, you can always choose to take a leisure walk to clock your daily steps count. If you have booked any of the Club InterContinental room, suite and villa, you will be able to access the Sun Peninsula Club Lounge, one of of favourite spots in the resort. You are able to check in or out right at the comfort of the Sun Peninsula Club Lounge. We like the Club Lounge for its privacy, the fabulous ambience, personalised service and last but not least, the food. Club guests can choose to have their morning breakfast here, and it is a non-stop eating affair at the Club Lounge which also serves up Afternoon Tea and evening cocktails with canapés. From the Club Lounge, which is located at the Heaven level, you get a very good bird’s eye view of the whole resort. We could gaze out into the sea all day. The Restaurants Without a doubt, the highlight of the dining options at the resort has to be La Maison 1888, the fine-dining French restaurant managed by renowned Three-Michelin Starred Chef Pierre Gagnaire from France. We recommend to go for the lunch serving if you are looking to enjoy the nice natural light sipping into the black-white French grandeur interior décor of the beautiful restaurant. For daily breakfast, Citron restaurant located at the heaven level is where most of the hotel guests will be having their buffet breakfast at. The buffet spread at Citron restaurant is very impressive, which include the likes of ala minute authentic Vietnamese pho counter and egg station. Just make sure you leave some space for the International spread too, this is easily one of the best hotel breakfast buffet we have ever had. As Club Room guests, we had the privilege of enjoying our breakfast at the Club Lounge where the service is also more personalised. That said, if you are lucky, do try to get one of the 5 outdoor pods within Citron restaurant, where you can dine while enjoying full views of the resort. Other restaurants here includes the beach front casual bites and bar lounge, the Long Bar, and the seafood and grills concept, Barefoot. If you are looking for a round of drinks, you can head over to the Buffalo Bar located in the same building as La Maison 1888 for some wine and cocktails. Rants We stayed two nights in the resort, and never once managed to find enough reason to step out of it to visit the nearby Danang City. So if you will like to make a visit to the key attractions in Central Vietnam, including Danang City, Hoi An, My Son and Hue, perhaps it would be a good idea to visit them before or after your stay here. Just FYI, the resort does provide complimentary scheduled shuttle service between the resort and both Danang City and Hoi An. 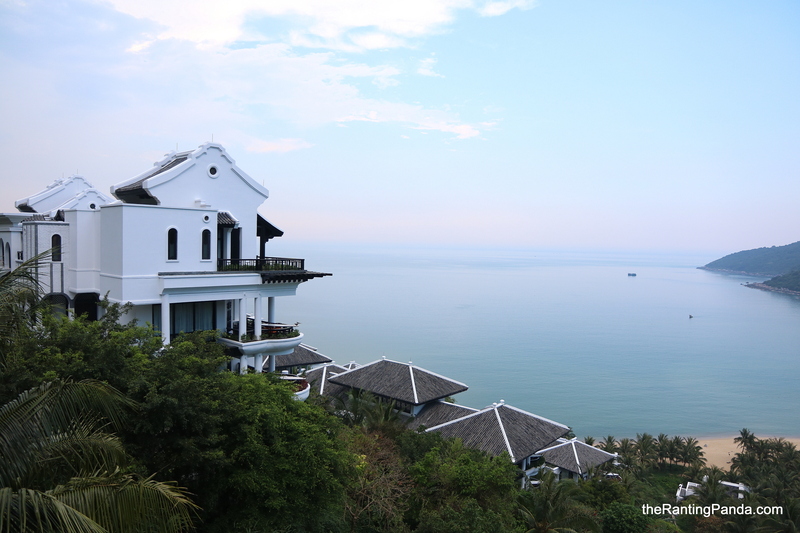 Overall Experience Our stay at InterContinental Danang Sun Peninsula Resort is hands down one of the best resort stays we have ever had. From the top-notch service, to the beyond gorgeous and splendid property, the resort delivers on all fronts. This is one resort to head over if you are ready to splurge, for your mini-moon, proposal trip, or simply a romantic getaway. Get ready to be impressed. Make your reservation at InterContinental Danang Sun Peninsula Resort here.